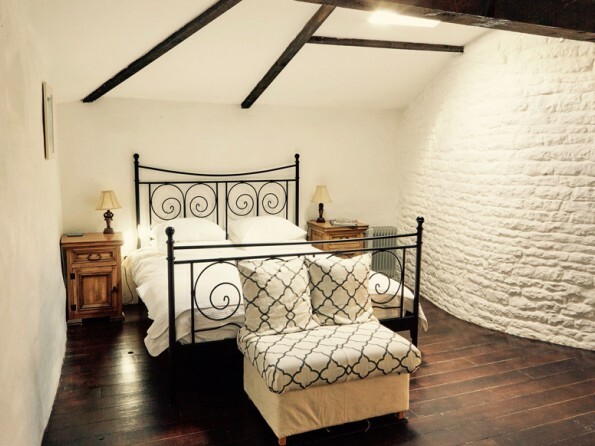 Just one of three beautifully restored houses at the award-winning Courtyard at Sainte Catherine, Maison Cachee is a traditional cottage where you can relax in peaceful welcoming surroundings and explore the lovely Charente region. 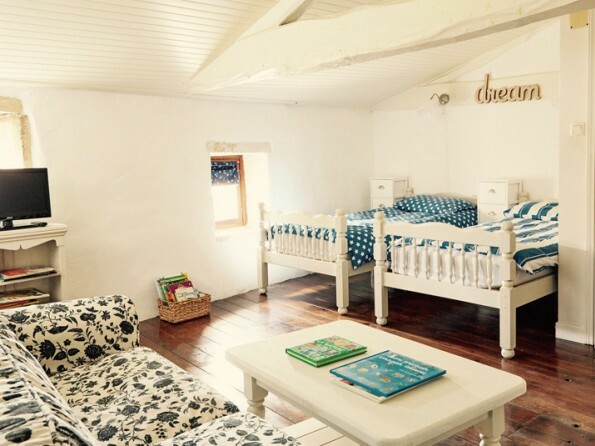 Formerly the buttery and kitchens serving the old priory, Maison Cachee is tucked away at the far end of the main house and offers peaceful, private accommodation for up to two adults, two children and a baby. The interiors have been completely transformed into a chic stylish little sanctuary, the whole Courtyard at Sainte Catherine site is warm and welcoming and the rural surroundings are incredibly therapeutic. 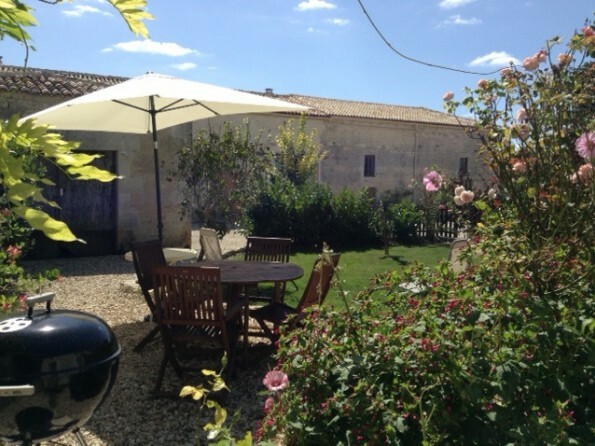 Whether you’re at the gite star gazing and savouring home cooked meals or out and about discovering the Charente river, the abundant wildlife and the buzzing towns of Jarnac and Angouleme, you are sure to have a restful and restorative holiday. If you can drag yourself away from the glorious setting of the Courtyard, then you’re in the perfect place to discover the region and the wonderful historic towns of Jarnac, Cognac and Angouleme. Jarnac has the Charente River as a playground - fantastic for outdoor living and watersports. Angouleme and Cognac can offer you culture, nightlife and shopping, as well as museums, galleries and fabulous places to eat and drink. The Courtyard is close to several transport routes through France and near plenty of airports, as well as the TGV (high speed train link) in Angouleme. You can pick up a hire car at any of the airports, or we can organise a transfer for a small fee. 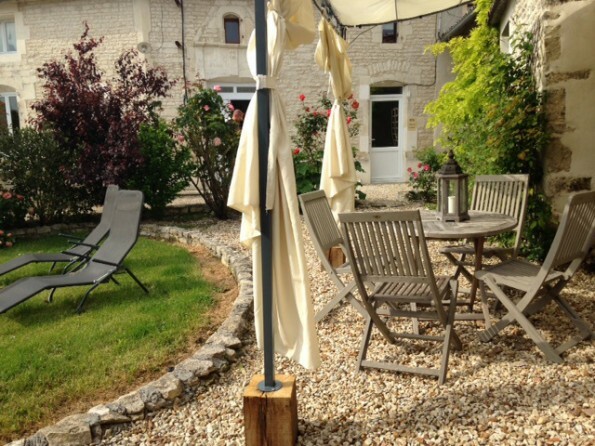 The Courtyard is 2.5 hours from Paris by direct train - London - Paris - Angouleme is only a 5 hour journey! Nearest airports are Limoges (1hr 15), Bordeaux, La Rochelle and Poitiers (1hr 30), Bergerac (2 hrs 30). Nearest ferries are St Malo and Caen (5 hours), Roscof (6 hours) and Calais (7 hours). 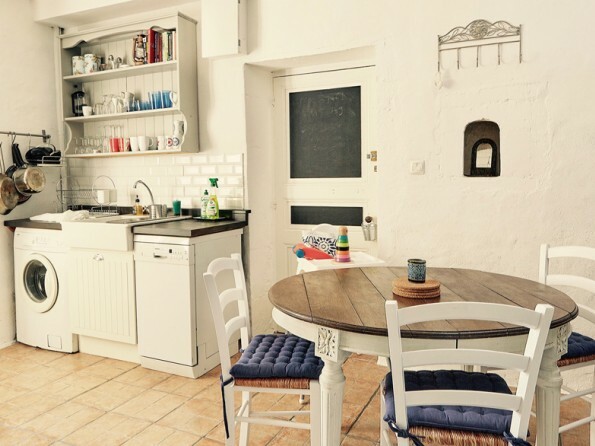 The gite has two bedrooms – one Master with a king size bed and a proper cot and a second with two singles. 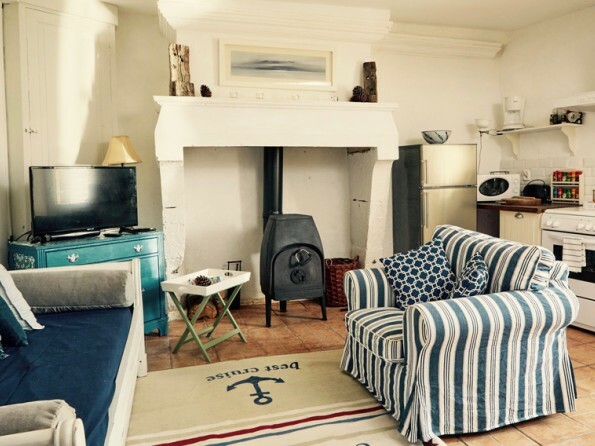 Upstairs you will also find a shower room and downstairs there is a fully fitted kitchen and family room with a sofa, a wood burning stove and a dining table. Outside there is a private space with both dining and lounging furniture. There is a gorgeous pool on site. Aside from the accommodation itself, there are two other main focuses at The Courtyard: food and art. Your host Steph is a culinary whizz, and will happily produce meals for you if you don’t feel like cooking. The abundance of vegetables and pulses which are grown in the Charente region lends itself to vegetarian cuisine, something which is not always easy to find in France. Our menus change subject to season and produce availability and are not just focused on French cuisine. We can cater separately for the youngsters too. Our fairy lit outdoor dining pergola allows us to cater for all of our guests on site at the same time with our Table D’hote Licence. You can also book yourself onto a painting course here at The Courtyard. The British landscape artist Simon Stooks is artist in residence and runs painting courses for small groups on set dates. Photography lessons and even portrait sessions are available with Ian Wallace. So if you want to get them most from your camera or organise that family portrait session you have been putting off now is the time. The famous food writer Louise Pickford; editor of over 30 cook books and former food editor of Grazia Magazine runs cookery courses from her home 40 minutes away and on site here at the courtyard. Enquire at the time of booking for which dates and which courses are running. 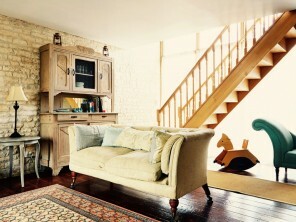 In high season (June, July and August) bookings are a minimum of a week and changeover day is Saturday. Changeover day is flexible during other times of year and there is a three night minimum stay. Prices include all linens, bath towels, WiFi, private parking, end of stay cleaning and concierge service. Couples rates are available for under occupancy outside June, July and August. Breakfast Basket delivery €14 pp. Table D’hote €35 pp.